The Destination Chesterfield Partnership will be referred to in the terms and conditions as “Destination Chesterfield“, “we” or “us“. 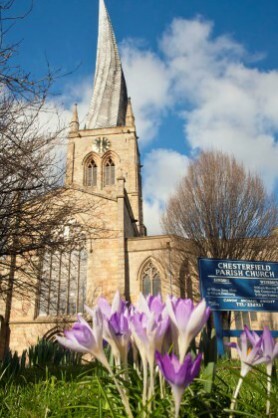 This Destination Chesterfield website is intended to provide information about the town of Chesterfield as a place to live, visit, invest and to do business, Destination Chesterfield, how and why it operates and the services it provides. The materials used by us on the www.chesterfield.co.uk website, or any other website owned or managed by us, are presented solely for the purpose of informing users and promote the town of Chesterfield as well as Destination Chesterfield, its services and the benefits of becoming a Chesterfield Champion or to promote Chesterfield, the organisation or event for which another website might be set up by us for that purpose. We will not be liable to users of this Destination Chesterfield website for any loss or damage of any nature whatsoever and howsoever arising out of, or in connection with, the viewing, use or performance of this Destination Chesterfield website, or any other website owned or managed by us, or its contents whether due to inaccuracy, error, omission or any other cause and whether on the part of the Destination Chesterfield, our employees or agents, or any other person. We reserve the absolute right to alter or discontinue any aspect of this Destination Chesterfield website or any website owned or managed by us or the services provided through any of those websites, including all access to it. We cannot guarantee that this Destination Chesterfield website nor any other website owned or managed by us will operate continuously without interruptions, be error free or any other interruptions in service beyond Destination Chesterfield’s control. You must not attempt to interfere with the proper working of this Destination Chesterfield website or any website owned or managed by us and, in particular, you must not attempt to tamper with, hack into, or otherwise disrupt any computer system, server, router or any other internet-connected device associated with this Destination Chesterfield website or any other website owned or managed by us. When you first visit this Destination Chesterfield website, or any website owned or managed by us, we may send you a cookie. A cookie is a small file that is placed on your computer’s hard drive for record-keeping purposes, and we will use them to do a number of things. You may make a copy of the content on this Destination Chesterfield website or any website owned or managed by us for your personal, non-commercial use only provided that you keep all copyright and other proprietary notices intact and you agree not to modify, copy, reproduce, republish, upload, post, transmit or distribute, by any means or in any manner, any material or information on or downloaded from this Destination Chesterfield website or any website owned or managed by us including but not limited to text, graphics, video, messages, code and/or software without our prior written consent. Destination Chesterfield makes no representations whatsoever about any other sites which you may access through this Destination Chesterfield website or any other website owned or managed by us or which may link to this Destination Chesterfield website. When you access any other website please understand that it is independent from the Destination Chesterfield and that we have no control over the content or availability of that website. A link to any other website does not mean that the Destination Chesterfield endorses or accepts any responsibility for the content, or the use of, such a website and shall not be liable for any loss or damage caused or alleged to be caused by or in connection with use of or reliance on any such content, goods or services available on or through any such site and resource.